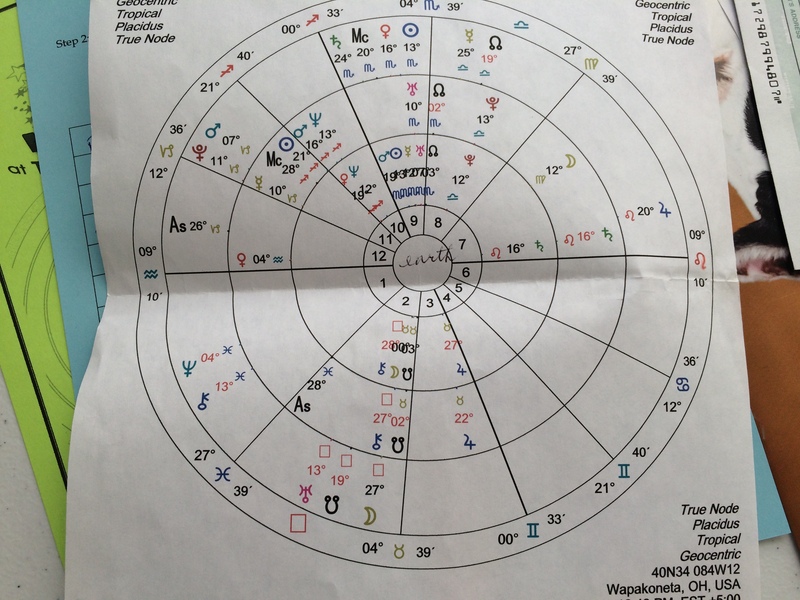 “Your birth chart doesn’t change,” Sue continued. I look at the piece of paper: concentric circles divided into twelve sections, some dotted with hieroglyphic-looking symbols. I felt like I’d need a PhD in ancient Egyptian history to decipher the thing. Thankfully, I had Sue. Or her voice, at least. “You could have a reading done years from now, and would be exactly the same. Now, based on this chart, there are two things that are very significant in your life. The first is travel. I’m not sure if that’s literally or not, or what it looks like in your life. All I know is that it’s part of who you are.” Part of who I am? So THAT’S what it is! For years I thought my abundant amount of traveling was just a phase–that thing lots of people do in their twenties before settling into their “real” life. Then I kept doing it in my thirties. And now, at nearly forty, I had long since figured out that travel was part of my “real” life. But not until Sue told me her insights did I finally feel relief. I understood why: it’s simply who I am. You can believe whatever you want about astrology. Lois and I both love hearing other people’s thoughts, ideas, and insights. We certainly don’t agree with them all, but love that we live in a country where people can speak their mind, and we can choose to believe whatever we want. So when Lois first heard about Sue, she thought she’d give it a try. At a writing retreat soon after, Lois shared her amazement at what insights this woman had for her and offered to gift each of us a reading. All we had to do was provide the date, time, and location of our birth. Most of us know when and where we were born. But the exact time usually takes some research. Unless you’re me. On the wall in my childhood bedroom was a ceramic stork holding a baby in a blanket on which was listed all my stats–including the exact moment I came into this world, which has stuck with me ever since. I gave all the info to Lois, and a month later there I was, listening to my reading. Sue continued. “The second thing that’s significant in your life is education. I don’t know if that means you are highly educated, or if you’re a teacher, or you like learning . . . ” Um. All of the above, I thought. At that very moment I had one Bachelor’s degree, two Master’s degrees, and was in the midst of getting certified to teach English abroad. I’d taught everything from algebra and anatomy to crochet and computer systems. And two years earlier, I spent four months in a work-exchange program taking fifteen classes in everything from wooodcarving and blacksmithing to Scottish cooking and genealogy. Stunned, I paused the CD. I needed to write this down. Or did I? Slowly it sunk in. No wonder I flit around the country and the world. It’s not because I haven’t found a place to settle. It’s not because I’m trying to escape something. It’s simply because it’s who I am. And that education piece? It’s one of the things I love most about travel: learning about a place, its people, and its culture. Sure, any reader of this blog might be able to tell me the same things Sue did. But all Sue had were my stats. “You’ve always been good at saving money,” she said, “but it looks like you also spend a lot of money.” This mystified her, but made perfect sense to me. I save so I can spend. On travel. She went on to tell me what my next six months would entail, and I can now report from the other side that she was exactly right. My mother, whose only travel experience to third-world countries has been via a cruise ship, said in her Christmas letter that not only is she raising $250,000 to build a village in Haiti (yes, a whole village), but that she and my father intend to go to Haiti this time next year. How did I, their itinerant daughter, not know of this? I’m not taking off anytime soon. But when the bug hit this time, I didn’t find myself pining for another trip. I’m always excited to hear about other people’s travels. And I know I’ll be traveling. For the rest of my life. After all, it’s written in the stars. P.S. For those of you who want to learn more about and/or support my mother’s work in Haiti, click here.